Every day, we read about the fate of the honey bees. We are told the bees are dying. We are met with the fear that the bees are disappearing. Honey bees pollinate about 70% of the food we eat every day. Were it not for the honey bee, our diet would be limited to wheat and rice. May Farms LLC is owned and operated by Ralph “Buddy” May Jr., a Double Master Beekeeper. he has been awarded the title of EAS Master Beekeeper and completed all the requirements for the Master beekeeper Level of the South Carolina beekeepers Association. Buddy has been a beekeeper for 12 years now and has about 40 hives. His farm produces honey, pollen, blueberries, garlic and much more! When he is not tending his own farm, Buddy enjoys teaching others about beekeeping. He offers his own Introductory Beekeeping Hands-On Workshops. He also teaches more advanced beekeeping courses through Furman’s OLLI program. 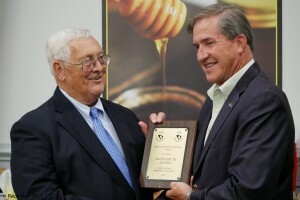 Buddy (left) presented Master Craftsman Bee Keeper Certification after 14 years of study and service in South Carolina.